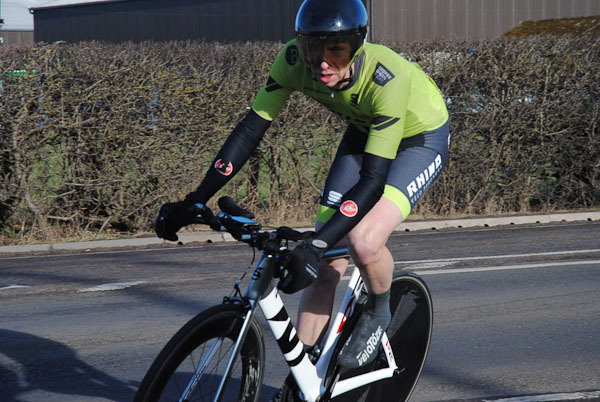 The SB Sports Injuries Series got underway with reigning Champion and Veterans Champion Ian Nisbett setting out a successful opening defence of those titles with a determined effort at North Shropshire Wheelers Hawkstone Hilly 19. Held over two laps of the tough and technical Prees Lower Heath – Weston Under Redcastle – Marchamley things were made even more interesting with a nagging wind and slippery leaves adding to the challenge. Hafren CC’s Nisbett took the win by 1 minute 4 seconds from unaffiliated rider David Scott in a great time of 46 minutes 5 seconds despite his misgivings about conditions as he revealed he left something in the tank: “I held back a little during the race as I was concerned about slippery conditions and the side winds. Overall, I was pleased with a solid, consistent effort on what is a challenging course – and especially for my first ride of the season“. Nisbett wasn’t finished there either as he also took the win in the Veteran’s competition in a excellent +4:45 from North Shropshire Wheelers’ Gino Trasatti. 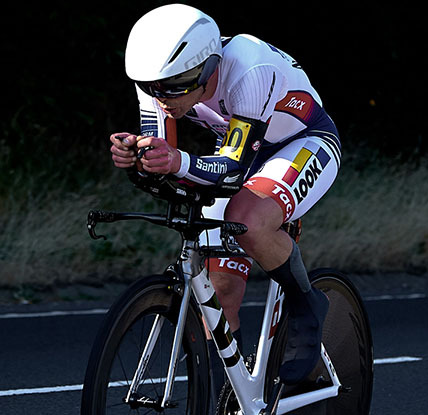 Scott meanwhile posted an excellent effort of 47:09 – all the more impressive for being done on a road bike. He was pleased with his efforts, stating: “I was very happy to come away with second on my road bike. I made up a lot of time on the climbs, but with the wind on the downhill and flat sections I couldn’t match the speed of a TT bike! Very happy with numbers early season though“! 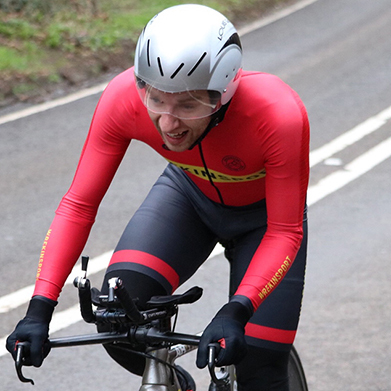 Nisbett’s main challenger for points was SCCA Private Member Ollie Atkin, another rider proving that a road bike was a good choice on this course, setting a fine time of 47:43 and getting his first taste of both this tricky circuit and the 19 mile distance. With the terrain including 920 feet of climbing he revealed he had trouble judging his effort, but was otherwise pleased with his morning’s work: “My first time doing the 19 distance on this course, a difficult one to pace. The wind certainly played more of a part on the second lap but I love the hill efforts so had fun too! Pleased to take third against some solid riders. Thanks to North Shropshire Wheelers for their perpetually friendly events and making these early season Sunday mornings less of a ‘thousand-yard stare affair‘”. Atkin, entering the SB Series for the first time surprised another experienced road bike rider Dan Watts by 9 seconds – though Watts was still pleased with his effort: “A nice crisp morning – I was thankful to finally see some sunshine. Happy with my performance for my first outing this year on a course I haven’t ridden in years, I aimed for a 47 on my road bike and just about achieved it“. With Nisbett taking victory in the Veteran’s competition 69 year-old Gino Trasatti demonstrated a determination to get in the mix, taking Veteran’s runner-up spot with a solid +2:53 to see off Nova Raiders’ Andy Rose by 24 seconds despite suffering a little in the cold. He stated: “It was a great sunny morning but very cold. It took me quite a while to warm up and get up to speed. I must say I was a bit lazy on the first lap but made up time on the final lap. I will not take my age into consideration and I’m ready to improve for the season ahead. I enjoy being a member of North Shropshire Wheelers and a big thank you to everyone who I train with, the other riders and not forgetting all the organisers and helpers“. 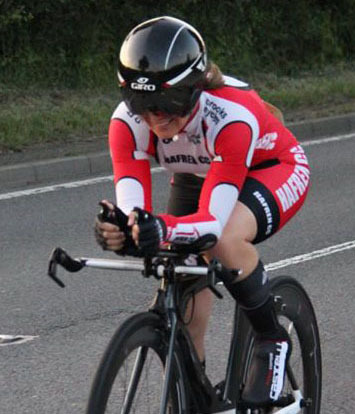 It was another Hafren CC rider setting the early pace in the Women’s Series with Louise Hurdley taking the win in 1:01:04 from North Shropshire Wheelers’ Elaine Langley despite suffering in the conditions. She stated: “I was pleased to get round in just over the hour with the relentless wind and the punchy hills thrown in! Great to get the season underway“. 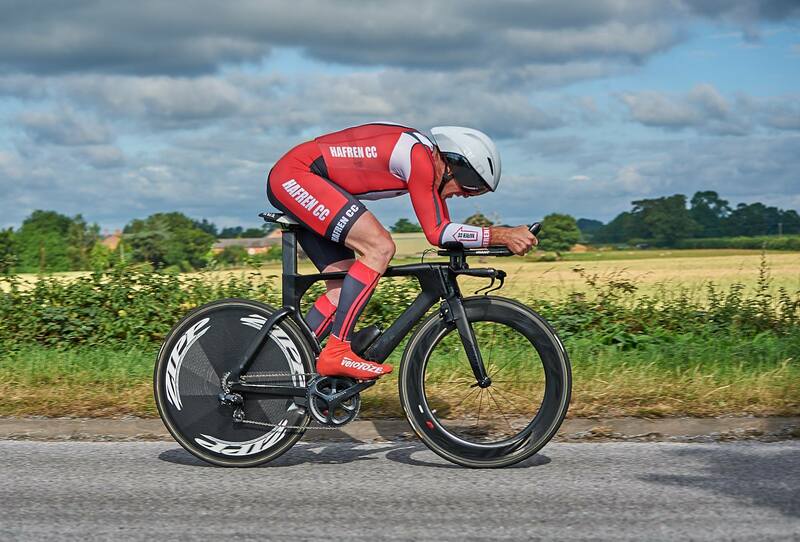 Round 2 of the SB Sports Injuries Series takes place at 3pm on Saturday, 30th March as Shropshire Cycling Clubs Association promote the first of three Spring 10’s on the Waters Upton – Hodnet course. Sign on from 2pm at Ellerdine Village Hall.